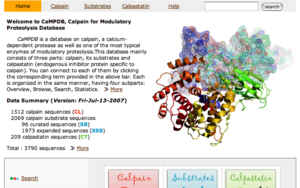 CaMPDB is a database on calpain, a calcium-dependent protease as well as one of the most typical enzymes of modulatory proteolysis. 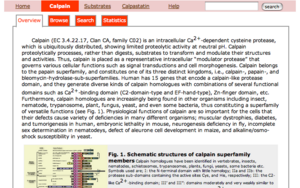 This database consists of three parts: calpain, its substrates and calpastatin (endogenous inhibitor protein specific to calpain). You can go to each of them by clicking the corresponding term provided in the above bar (or the pixtured boxes in the toppage). Each part is organized in the same manner, having four subparts: Overview, Browse, Search, Statistics. This page helps you to use these contents more effectively. In default setting, the above contents are hidden except Introduction. All sections can be revealed by clicking "open" and can be hided by clicking "close". Each section can be shown by clicking its title and be hided by clicking it again. 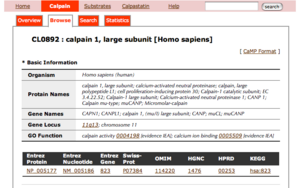 This page gives you a list of calpain sequences, which can be either of the two views: List view or Tree view. You can click each sequence of the list to show its details. The followings are the options for showing the list. 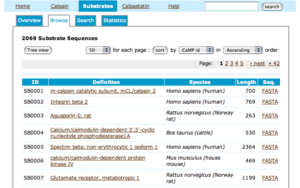 You can select the number of sequences which are shown per page. 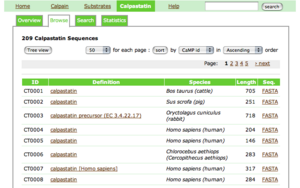 You can select the criterion to sort sequences, out of the following four: CaMP_id, Definition (protein name), Species, Length (sequence length). You can select the sort order out of the following two: Ascending and Descending. You can switch to the Tree view by clicking "Tree view". In default setting, only the three children of the root are shown: Bacteria, Eukaryota, Unknown. You can see its children by clicking each of them. By repeating this clicking, finally you can see leaves (sequence entries). You can click each leave (sequence) of the tree to show its details. You can switch to the List view by clicking "List view". 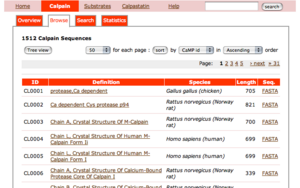 This page allows you to do search over the contents on calpain sequences. A simple usage is to enter one or more terms in the textbox and to click the "search" button. If you enter two or more terms, you can retrieve the results which have all these terms. A note is that when you enter IDs as terms, each result is not that with all IDs but the sequence specified by each ID. You can use a phrase with double quotes, e.g. 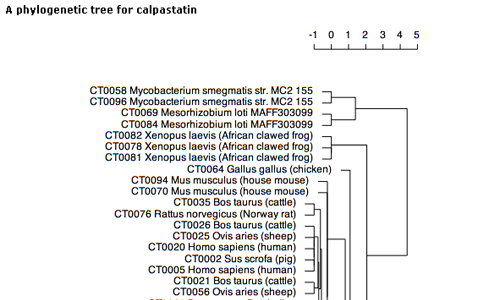 "calpain 10 isoform". You can select the number of search results shown per page. You can specify the search results by checking each box below. The following is an example of search results. You can see more results shown in one page by clicking "show more". 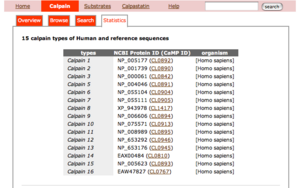 This page shows the classification of calpain sequences. 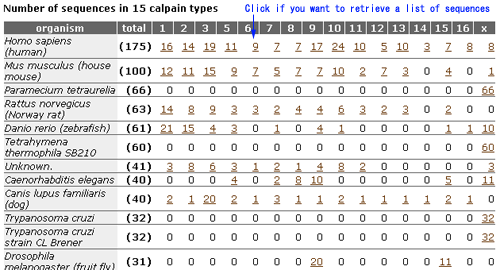 The first table shows the reference sequences of 15 calpain classes. 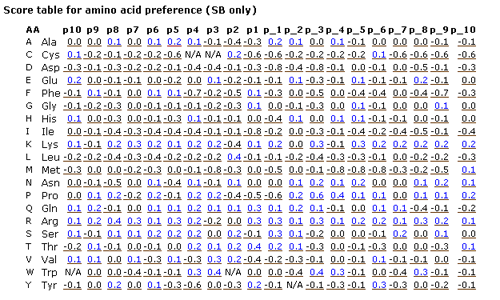 The second table shows, for each species, the number of sequences which are classified into 15 classes. The classification procedure is described at the bottom of this page. You can retreive a list of sequences by clicking the number of this table. The first two letters of CaMPID shows the entry type: "CL" indicates a calpain sequence. Basic information has the following five parts with gene IDs of other major databases: Organism, Protein names, Gene names, Gene Locus, GO Function. 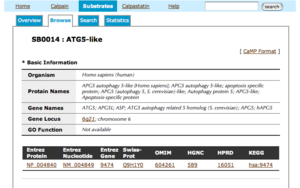 By clicking a gene ID, you can see the information of the corresponding database. 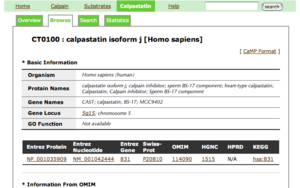 Information from OMIM has three parts: Description, Function and Reference. Structure Information has the following four parts: Primary Information, Domain Information, Sequence Information and 3D Information. 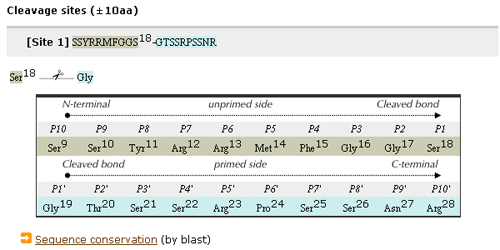 Primary Information of each entry has its sequence length, average mass and monoisotopic mass, which are computed by using a table given by ExPASy. 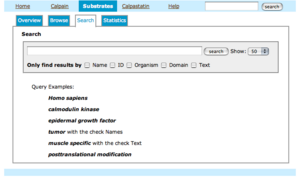 Domain Information of each entry has the links to the corresponding protein of four major domain databases: interpro, pfam, smart and prosite. In addition to this, you can see the colored domain structure which is computed by using HMMER. 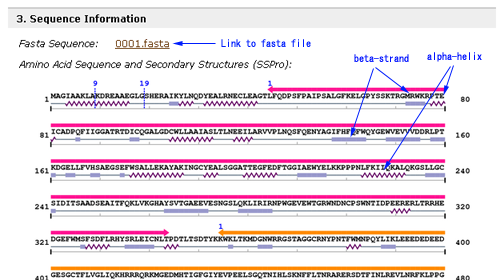 Sequence Information of each entry has the link to its amino acid sequence in the fasta format and its actual amino acid sequence and secondary structures which are predicted by using a software called SSPro4 developed by P. Baldi's group. In addition to them, the domain structure assigned in the above is also shown. 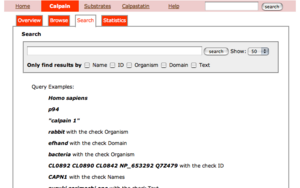 3D information (if any) has the link to the PDB (Protein Data Bank) database. References are those related with each entry and retrieved from PubMed. You can click "More" to see more references. 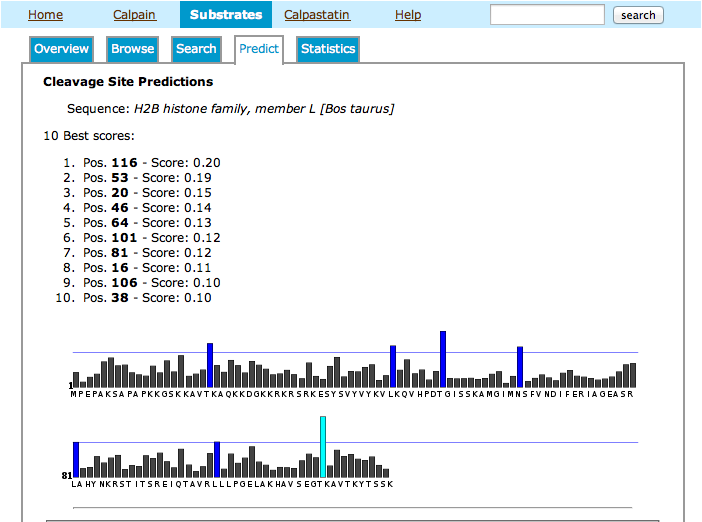 This page allows you to run a simple PSSM-based predictor on a putative substrate sequence in order to evaluate likelihood of cleavage sites by calpain. 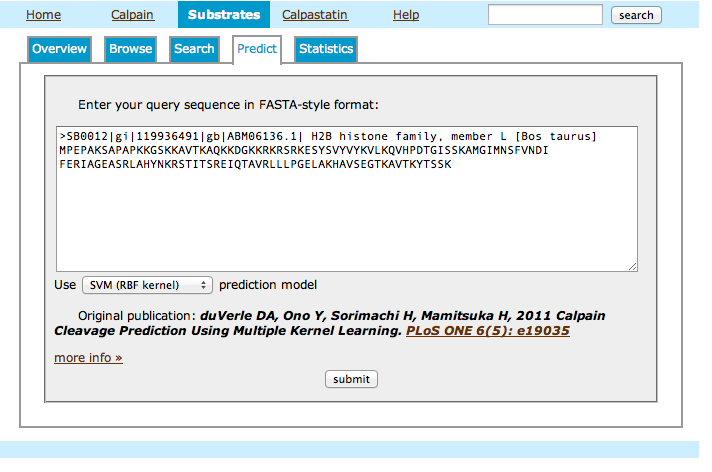 Enter your query sequence, either in FASTA format or as a raw string of single-letter-coded amino acids. Along with scores for the best 10 positions in the sequence, you will get a bar chart displaying all positive scores along the sequence. Top score is indicated in cyan, while scores above the top percentile are shown in dark blue. 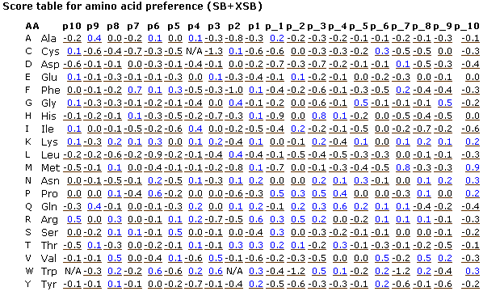 This page shows amino acid preferences of twenty positions near the proteolytic sites. They are computed in two different datasets, i.e. the sequences from literature only (SB) and not only them but also the sequences computationally retrieved from the database (SB+XSB). The computation procedure is described at the bottom of this page. 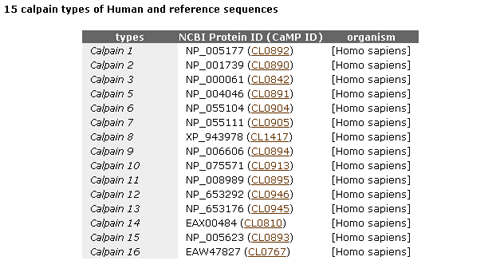 You can retreive a list of sequences by clicking the number of each table. 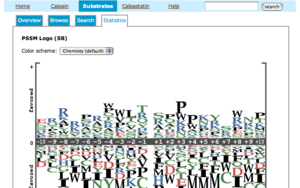 The first two letters of CaMPID shows the entry type: "SB" indicates a substrate sequence derived from literature and "XSB" means a substrate sequence computationally retrieved from a database based on a SB sequence. Cleavage Information consists of three parts: the number of cleavages, their references and the detail of each cleavage site. 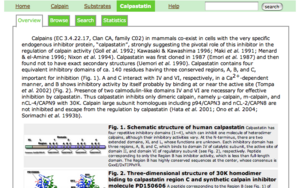 The number of cleavage sites and their references are shown. The detail shows the twenty (upstream and downstream) amino acids around the cleavage site. 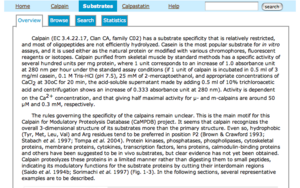 In addition to this information, the result of our original experiment on the proteolysis by calpain on the peptide of the twenty amino acids is shown (if any). The result is given by a score indicating the strength of proteolysis. 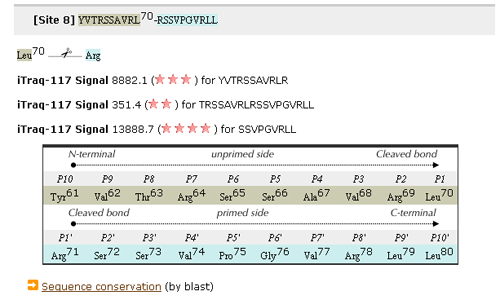 For example, "iTraq-117 Signal 8882.1 (***) for YVTRSSAVRLR" indicates that the peptide YVTRSSAVRLRSSVPOVRLL was split into YVTRSSAVRLR and SSVPOVRLL with a score of 8882.1. The larger the score is, the stronger the proteolysis is. Accompanying with the original score, stars are shown by taking the logarithm of the original score, because of the noisiness of experiments. 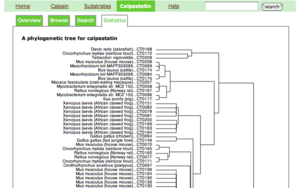 This page shows a phylogenetic tree of calpain sequences. The computation procedure is shown at the bottom of this page. You can click each sequence in the tree to see the detail of the corresponding entry. 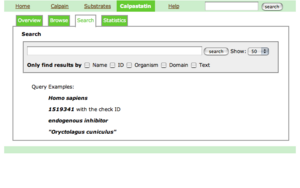 The first two letters of CaMPID shows the entry type: "CT" indicates a calpastatin sequence.